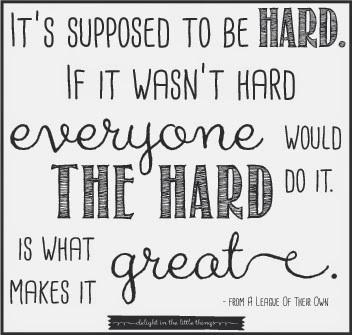 I absolutely love this quote from "A League Of Their Own." In so many areas of life you have a choice to take the easy way or the hard way. Now, don't get me wrong, I love when things come easy and don't like to make unnecessary work for others or myself. There are many hard things in life that are definitely not great and I have experienced that as well. But what I think this quote speaks to are those things that you really have to push yourself to do. It speaks to challenging yourself to go beyond the simple or expected. I am constantly challenging myself physically or mentally to stay sharp and to keep learning. I like this quote so much that it is the background on my laptop. Since I have had kids I spend a lot of time trying to instill in them this sense of choosing challenge over complacency. That in an of itself is hard! What made it great for me was something that my seven year old son told me recently. He was at a camp over the summer where the kids were paired up to work on building projects. His partner was two grades older and was content with getting by building the easiest structure each day. I happened to be out of town at the time and was asking my son during a phone conversation after the second day of camp what he was going to do about it because he really didn't like the way things were going. He said, "I told [the boy] that my mom's computer says that it is the hard that makes it great so let's pick a harder structure to build." I was so proud of my son for standing up for himself with an older kid, coming up with a kind way to motivate his partner, and for wanting to go beyond what was expected to challenge himself.